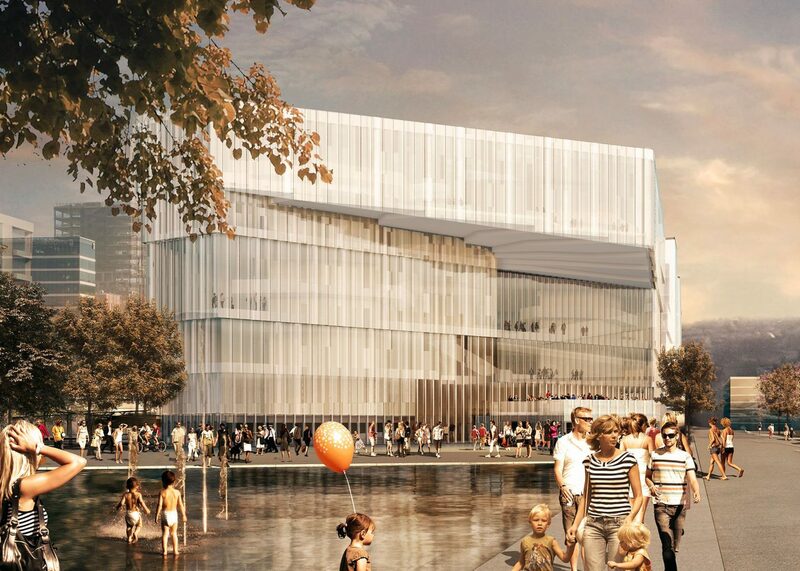 The new main branch of the Deichmanske Bibliothek, one of the oldest public libraries in Norway, is being built in the Bjørvika district directly adjacent to the Norwegian Opera in Oslo. When it opens as scheduled in 2020, Oslo will boast a modern and dynamic library which houses not only the extensive book collection of Carl Deichman, but also a cinema, media workshops, play areas, lounges and a restaurant. The architecture of the library was designed by Lund Hagem Arkitekter in collaboration with AtelierOslo and is closely linked to its role as a public space. The new library is planned as a six-story building with a basement. The main architectural concept is based on the large library space which runs through the center and extends upward across each floor. The library is to have a translucent facade, with the top floor cantilevered out and opening up in the direction of the city center. Recesses in the facade mark the east, west and south entrances of the building. Not only is the new library a functional building of high architectural quality, it is also innovative in its use of forward-looking, climate-friendly solutions. The idea is for the finished library to take the lead in terms of energy efficiency and reduction of greenhouse gas emissions. The ground floor facades of the halls and entrance areas are a steel post and beam design with triple glazing. The surfaces of the facades on the upper stories, in which the library rooms are located, are realized as a unitized facade with a completely new form and material concept . Solid facade posts with a diameter of approximately 20 inches have a retaining construction to accommodate panes of laminated safety glass with lighting features, both on the inside and outside, which can be opened for cleaning and maintenance purposes. The facade columns stand three feet apart. Not only do they provide shade when the sun is low, they are also the basis for the desired effects of incident light. The vertical facade columns consisting of fire protection-classified glass fiber reinforced plastic filled with thermal insulation, and the fill elements made of triple glazing, constituted the essential part of the development work together with the horizontal connector elements. The facades of the new Deichmanske Bibliothek were designed in such a way as to meet high thermal and climatic requirements with ease.